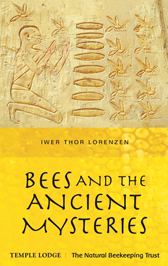 In an extraordinary exposition, Lorenzen – an expert beekeeper and student of contemporary spiritual science – describes the ‘Logos mysteries’, based at the ancient temple of Artemis in Ephesus, where priestesses were known as ‘Melissas’ (‘honeybees’) and the sacrificial priests were called ‘Essenes’ (or ‘bee-kings’). These cultic mysteries, he says, bore remarkable parallels to the workings of a bee colony – specifically in the relationship between the queen and worker bees to the spiritual ‘group-soul’ of the bees. Lorenzen commences his unique study with a discussion of flowers and insects, exploring their common origins. He then describes the beginnings of the honeybee, its connection with the fig wasp, and the subsequent controlled transformation of the latter that took place in pre-historic mystery-centres. Breeding the honeybee from the fig wasp – a sacred deed performed at consecrated sanctuaries – was part of the ‘Fig-tree mysteries’. The initiates behind this task developed the ability to commune with the bees’ group-soul and to work consciously on the mutual development of the hive and humanity. This concise but rich work features an illuminating foreword by Heidi Herrmann of the Natural Beekeeping Trust as well as a lucid introduction by translator Paul King that explains the anthroposophical concepts employed by Lorenzen in his text. IWER THOR LORENZEN (1895-1976) was born in Harrislee Flensburg, Germany, and began his career as a teacher in 1914. Whilst serving in the First World War, he became acquainted with anthroposophy – as founded by Rudolf Steiner – through a fellow soldier. After the war he returned to teaching, later moving into special education. He set up his own school near Hamburg in 1949 where he remained until his retirement. Having worked as a volunteer in the Zoological State Institute in Hamburg from 1935 onwards, Lorenzen was also a biologist who was revered for his love and knowledge of beekeeping, particularly amongst biodynamic farmers. He published his key work on beekeeping (published in English as The Spiritual Foundations of Beekeeping (Temple Lodge 2017) in 1938 and wrote another nine books as well as numerous articles on the insect and animal world, metamorphosis and evolution.